Immediate hydration with UV protection with hyaluronic acid, vitamins A, E and C.
A daily moisturiser enriched with active botanicals to perfectly hydrate for younger looking skin. Designed to deeply moisturise, mattify and even skin tone, it has the added benefit of natural, non-greasy, non-whitening SPF protection. Apply generously to clean, dry skin 15-20 minutes before sun exposure. Provides the perfect base for make-up. Please note this product is not water resistant. 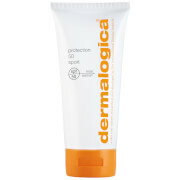 Apply generously to clean, dry skin 15-20 minutes before sun exposure. Provides the perfect base for make-up. Please note this product is not water resistant. Aqua (Water), Simmondsia Chinensis (Jojoba) Seed Oil, Zinc Oxide (nano), Glycerin (Vegetable), Cetearyl Alcohol, Caprylic/Capric Triglyceride, Cetearyl Olivate (and) Sorbitan Olivate, Rosa Canina (Rosehip) Seed Oil, Helianthus Annuus (Sunflower) Seed Oil, Oenothera Biennis (Evening Primrose) Seed Oil, Sesamum Indicum (Sesame) Oil, Sodium Hyaluronate (Hyaluronic Acid), Camellia Sinensis (Green Tea) Leaf Extract, Aloe Barbadensis (Aloe Vera) Leaf Extract, Glycyrrhiza Glabra (Licorice) Root Extract, Cucumis Sativus (Cucumber) Fruit Extract, Chamomilla Recutita Matricaria (Chamomile) Flower Extract, Calendula Officinalis Flower Extract (and) Glycine Soja (Soybean) Oil, Hamamelis Virginiana (Witch Hazel) Water, Tocopheryl Acetate (Vitamin E), Retinyl Palmitate (Vitamin A), Ascorbyl Palmitate (Vitamin C), Sodium Stearoyl Glutamate, Rosmarinus Officinalis, (Rosemary) Leaf Extract, Xanthan Gum, Triacontanyl Pvp, Glyceryl Stearate, Salicylic Acid, Phenoxyethanol, Ethylhexylglycerin, Glyceryl Isostearate, Polyhydroxystearic Acid, Parfum, citral*, geraniol*, citronellol*, limonene*, linalool*, *Components of natural essential oils.